Is this a prank on me? It's the prank that they misspelled prankster, isn't it? Well, I can forgive them their peculiar name, as the other beer they gave me was very, very good. Will this be another to add to the list of excellent beers from tiny little brewers? Let's say yes. As the name implies, the beer is a dusty golden color with a very light tan head. 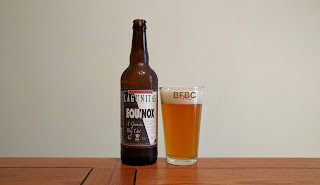 There's no evident lacing, and the cap of bubbles are very (almost suspiciously) evenly distributed across the top of the beer, but they do not restrain the quite potent aroma of barley, apricot, apple, and spices. It's intriguing more than it is familiar. Yet another beer from Ballast Point. What? I never did any Ballast Point before? That seems unimaginable; yet, a quick search of the blog (that search is at the right on the main page of my blog) proves out that I haven't reviewed a single one of their beers. Well, let's remedy that right now. The pale yellow beer has a very white cap that is somewhat sticky. Lacing immediately above the top of the liquid is solid, but it follows the beer down. The aroma is a little bit funky, but it has the hallmark maltiness that I've come to expect from a good lager. The subtle yeast twang that is in there reminds me (and very few beers do) of the many, many nights spent enjoying beer at the Penn Brewery in Pittsburgh with my brother. That place absolutely dripped with the stuff. Sierra Nevada's selection has been, succinctly, fantastic. I don't know if my local guy just stocks the good ones and doesn't bother with the bad ones, but this is in stock, so I have very, very high hopes. The fact that this is a "whole cone" IPA means that... I don't really know what to expect. I mean, I've never had a whole cone, and I don't know what makes that different than the regular IPAs. The beer is a lot darker than your average IPA. It's a very attractive deep amber with a sticky-as-hell head that dies down to a fluffy pillow atop the attractive beverage. 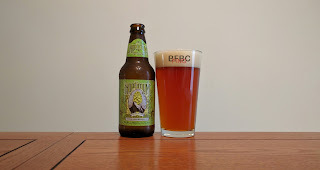 The aroma is pine hops and a smooth, creamy malt. It is one heck of a good smell, and I really want to drain this glass. This beer has a cute name, a nice label, and an interesting description as a lager aged in bourbon barrels. Eagle-eyed readers will notice that I normally avoid beers that are aged in liquor barrels. This is a direct result of the experience with several of these kinds of beers, not the least of which being the Innis and Gunn beers. The beer's head is not voluminous, and it goes away almost completely (limited to the familiar ring around the top of the glass and little else). The color of the beer is a very pleasant brown-hued red. 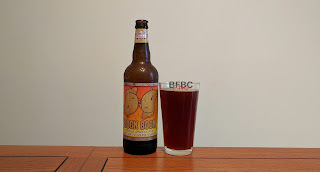 It's not the color I expect from a bock, but I find it intriguing and alluring, so the color is good. The aroma is strong and about knocked me back as soon as I opened it. It is bourbon, vanilla, citrus, and earth, and it actually smells really, really good. The previous two beverages I had from this company were the hard root beer and the ... not Mountain Dew (with alcohol). They were both pretty middle of the road, and I'm not sure any other than Coney Island Root Beer will ever actually make it into the realm of truly good beer replacements, but this Dr. Pepper beverage might add to the list. The beverage is pretty much reddish-caramel color, just like Dr. Pepper. The aroma is very much like the aforementioned drink, but it has that familiar smell of heavy alcohol added in. I can't say any of this experience is different than what I expected at all. Will the taste give something up other than Dr. Pepper with alcohol added? I don't really understand the label which says that this beer is starring Greg Kock, Drew Curtis, and Wil Wheaton. It also says that this is a collaboration, and I'm not reading that crappy, tiny font to read the long and - I have no doubt - boring story. 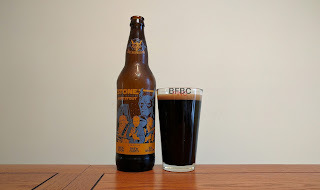 Instead, I trust that Stone will give me another good beer, and I'm moving in for the kill. Black as the midnight sun, the tan head is pretty minimal, and it dies down to a simple ring with some scattered floating pillows on top. The aroma is sweet malt, maybe some oatmeal, and definitely the Holy Trinity: chocolate and toffee and coffee. I am not exaggerating by saying that I'm really looking forward to this. Ah, Lagunitas. I don't care that you're not technically a craft brewer anymore. Yes, I was scared when Heineken acquired a 50% steak in you, and I thought that you might let your standards slip or become some kind of commercial juggernaut, but you still come up with off-the-wall names, goofy labels, and experimental beers. I can't quit you. The beer is kind of a straw yellow with a bit of orange. The sticky white head is pretty much exactly what I would expect from a Lagunitas beer. I mean, they have some kind of template that their beers have to follow, and that sticky, beautiful head is one of them. Points for them! The aroma is heavy on the grains with maybe a hint of citrus. Might this be a hipster beer? Actually, there's a good chance of that. The pitch black label that doesn't make a lot of sense - and it's in a can - means that hipsters may gravitate to it. I don't care; so long as it is a good tasting beer, market it however you want. 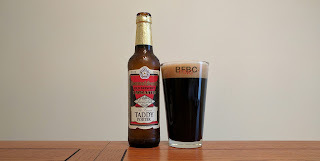 The thick, black beverage comes with a top of dense, dark tan foam that lets the drinker know that this is not a beer for the casual drinker who might want to venture from their favorite domestic macro-brew Bud or MGD (or PBR, if you're hipster). The aroma is heavy malt, and that's pretty much it. I'm not sure if I should be smelling the oatmeal right now, but I'm not. In other oatmeal stouts, I would, but that just means these guys aren't doing the same thing as everyone else, and I encourage that. I have had a few of these root beers. I hated the first one, but I think I was way too hard on it. The whole idea of what I should be expecting has changed and is - I think - more evolved now. I know I have a lead contender, and I really hope this gets at least that good. The look of the beverage is unremarkable. It's a kind of flat, very dark root beer. It's not actually flat, but it lacks the fullsome head of a proper root beer, that's for damn sure. The aroma is unmistakably root beer - even more than the others. It doesn't even have the whiff of alcohol about it. This smells like it could be Mug or A&W, and the scent is strong with this one. I was told at the time I was looking for beers that this beverage was like an alcoholic version of Mountain Dew or Squirt. Intrigued, I picked up a can for testing and reporting here. I figured that I like some citrus soda beverages (the glass bottle version of Sun Drop is a particular favorite, as it has real sugar and citrus detritus continuing to flavor the beverage even after the sucker is put in a bottle) so I might just like this one, too. The beverage is a bit more green than I remember The Dew being. It's certainly more colored than Sun Drop or even Mello Yello. The aroma is very strong with alcohol, and it's kind of light with citrus. Aside from that, there's not much to say. If someone sat this down in front of me and told me it was a Dew, I wouldn't believe them. 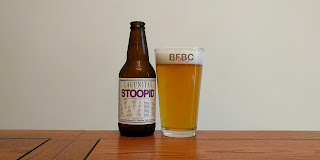 I could make up a bunch of stuff about Lagunitas at this point, but the simple fact is that I love these guys, and they very rarely give me anything other than a fantastic beer. So, I'm charging into this under the belief that I will be drinking one of the best beers ever. The pale yellow beer reminds me of a domestic macro lager. The head is similarly pretty dead, with a very shallow layer of bubbles kind of lingering on top. The aroma, however, is not a macro lager. Instead, it's a a bit pine and a little bit of orange. Honestly, it smells a bit rough and hard. First sip is not as scary as the smell was, but it certainly has quite a bit of pine hops. 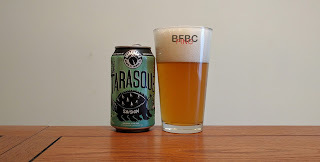 I haven't liked most beers with pine hops, and this one seems to fit into the category of beers I'm not a huge fan of so far. It's not overly bitter, but the pine hops are really detracting from most of the joy that I might otherwise find in the beer. Maybe a swig? My past experience with Samuel Smith was not particularly good. The fact is, I have yet to have what I would consider an above average beer from the UK. This one was recommended by a reliable guy I know, so I figure I will give it a chance. Should I read into the fact that I had to have my distributor special order it? Well, I'm not going to. Jeremy will order whatever he can, because he's awesome. It's a black beer, but the red hue around the edges turns almost purple in the sunlight coming through the window. The nice head simmers down to a 1/8th inch cap of bubbles with good enough lacing for a porter. The aroma is rich in smoke, oak, and chocolate. It has the hallmarks of a good porter, but I'm not going to get fooled by an English beer again. Bring on the taste. Lagunitas seems to have not slowed down since they got bought (maybe that's not the right term, as Heineken only owns 50% of them). Instead, they are using the newfound capital to produce new and more innovative beers. This is the first Lagunitas beer that I've noticed is not just Petaluma-born. Instead, this is also from Chicago. Why Chicago? No idea. Is it actually from two places? There's no way to know. The beer is a nice kind of copper color with a sticky head that leaves lacing like... like a Laginitas beer. There is a lot of suspended, ahem, stuff in the beer that I assume is a remnant of making beer. The aroma is pretty hoppy for an oat pale ale. The floral hops mix with maybe some oats and barley to give the beer a very nice bouquet. It makes one want to drink, and drink I shall. Another hoppy beer, Tim? Yes, another hoppy beer. I don't need your kind of attitude, dammit! I'm trying to enjoy a beer here. 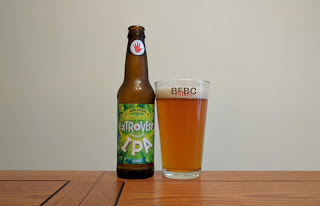 This one is from Left Hand, and those guys make beer that is eminently enjoyable. So, will the IPA be as good? Let's find out together. The dark copper beer has a sticky, sticky head that leaves lacing like a nut. The aroma is hit-you-over-the-head hops. I guess that's not out of the blue - this is "extrovert" after all. I can't express how much I'm looking forward to this one, and I don't have to wait any longer. First sip is really kind of spectacular. It's hoppy, but it's not overloaded to the point of a mouth full of hop bitterness. 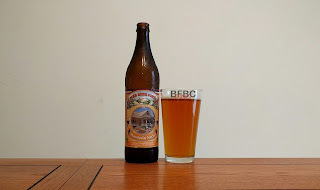 Instead, it has the floral and citrus (mostly floral) hops and the malt just kind of tossing a blanket over it before it manages to get the bitter spike. Will a swig be as good? Another beer that was on tap at the local distributor. This is a beer that is not local, though. Instead, it's a brewer that I'm familiar with, and New Belgium has taken some significant steps toward going from the middle-low ratings to the better than average ones. Anything on tap and fresh has a better chance of getting a good rating, as it seems that beer is simply better like that (like this). The beer is a delightful deep copper color that echos the color of the big, lovely vats that these beers are usually made in. The head survived the growler well, and it leaves a good cap of bubbles sitting on the top with very few points of nucleation inside the glass. The aroma is intoxicating hops. The hops seem like a good mix of mostly floral and slight citrus. 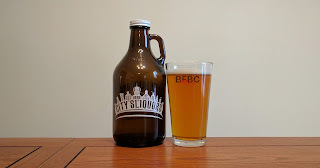 Another growler from the fine folks at City Sliquors. I paid for this one. The choice from the taps took some time and some samples, but I liked the tiny little sip of this, so I'm anticipating a damn good review. This brewer is another local one, and I am always happy to find a good local brewer. Fresh is more better. "But Lieutenant Dan, you ain't got no head!" Okay, it was legs, and this beer technically had a head very briefly. I know that the impressively friendly young lady who helped me check out had to deal with quite a bit of foam getting it into the growler, but it isn't foaming up very much now that I have it at home. A side effect of the container? Possibly. I don't like growlers very much for this reason - they aren't particularly well sealed. The color is a shiny gold. The aroma is bready, lemony, and malty. The only other Yee Haw beer that I had was okay, but it didn't really light my fire. My buddy Jeremy said that the dunkel was the best beer he's had from Yee Haw, and I'll take that advice from him. He knows his stuff, and he recommends only the beer that he knows is good. Sporting the aroma is bright, sparkling spice-filled malt, coffee, and possibly some oatmeal. It's a fairly nondescript deep brown with slight red highlights and a light tan head. 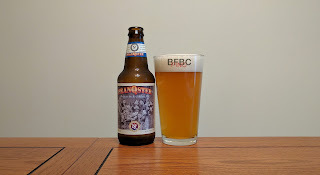 The idea that this is a more flavor-filled sibling to the Eighty is definitely impressed upon me with the aroma alone, so let's get into this. The Alpine Beer Company has done right by me so far. The worst I've had was good. The other two were both very good, indeed. So, I don't think I'm taking that big of a risk with this one, although the ingredients have me worried. The reason I saw this on the shelf and passed by so many times is that the idea of a mandarin-based cider or mead or something doesn't appeal to me. But these guys know what they're doing. The beer, and it has all the presentation of a beer, is an orange honey color with enough head to not be mistaken for a cider or mead. Points of nucleation abound with them generating more head as it dissipates, so the head is never allowed to go away entirely. The aroma is strangely more bready than I expected. The fruits that I expected to smell are missing. I assume they will be in the sip, but you never know. I appears Wiseacre picked an artist and are sticking with him/her. Fair enough. This one is not nearly as confusing as the last one. 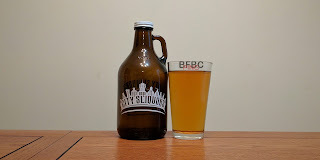 What IS confusing is the decision to go with a saison as the second beer out there (well, the second beer I saw at City Sliquors) as it is not exactly a mainstream style. The incredibly murky beer is still. There are no points of nucleation inside the beer, so the very thick head on the beer isn't being added to, but it doesn't die down beyond about a finger's width around the sides. The color, which I strangely forgot to mention is a slightly orange molasses color. The murkiness is filled with small-ish particles of... beer stuff. The aroma is fruits, flowers, and wood.